Along with the faral and fatake and the killa and kandil, Diwali for Marathi people was also about reading the Diwali Ank - the festival special editions of reputed magazines as well as those of the publications that mushroomed only at Diwali. Nothing gave us more pleasure than to relax after the early morning faral - the heavy meal coming straight after a pampering oil bath, and browsing through the Diwali magazines. The little nip in the air, the lingering heady perfume of that lovely utane, the jasmine oil and the beautiful gulab or chandan Moti soap on our bodies, the strong scent of burnt firecrackers, the mixed aromas of frying from homes around us, the balmy fragrance from the jhendu flowers adorning our homes – if this wasn’t how heaven smelled, I wonder how else! Other kids around me would run out to burst more crackers or collect unspent ones and try and explode them or collect the "stuff" from inside of them to make their own indigenous fatake. But a nerdy yours truly would be happier with the magazines - looking at the glossy ads for jewelry, reading recipes and kids' special sections. My aunt Anuradha Vaidya’s stories, long and short used to be published in several magazines. Once a whole novel had been published and I used to read her works, more out of pride that it was her work, than a real understanding or appreciation of the largely grown up themes. With Aai busy in the kitchen, this quiet time allowed some indulgent foray into the world of grown ups. I also remember reading a story about divorce, and being terrorised by the word “ghatasphot” and spent many nights worrying if Aai-Baba would ever go down that path. Once I even attempted reading a short story by G.A. Kulkarni, but beat a hasty retreat – why would anyone write/ publish/ read horror stories during Diwali? Occasionally, when Aai wasn't looking, a sneak a peek into the double entendre, chavat window cutouts in Jatraa or Awaaz magazine was well worth the risk taken. Also intriguing, especially since it was forbidden, was celebrity gossip from Devyani Chaubal’s Chanderi Chewing Gum. “ Babi SSSSS! Aey Babi SSSS! Aai’s ‘haak’ would interrupt my postprandial reverie. “Shejaari ha faral deun ye!” she would remind me of my annual errand taking steel plates full of sweets and savouries, covered by doilies to our neighbours. Sigh… time to go… but I would remember this was equally exciting, so I really didn’t mind it … for another adventure in terms of neighbours faral awaited. And didn’t I lap up all the praise the neighbours would heap on Aai’s innovative faral each year. “ What new things has your sugran Aai made this year?” was a question most anticipated; answered by me with equal excitement – for almost every Diwali Aai would make something unusual, rare or different! Like these Shakun Undas that I made for Shishir’s birthday this week – reconstructed from memory of the one time Aai had made them and a bit of help from the Internet. Pressure cook the chana dal until well done, but not too soft. Drain the water – you use this for “katachi amti”. Mix the gur or sugar with the boiled chana dal. Add the cardamom and nutmeg. Process the mixture in a food processor or a kitchen mill (puran yantra). If the mixture is too loose, you may need to microwave it for a couple of minutes to make it firm. Add the poppy seeds and coconut and mix well. Allow the mixture (puran) to cool and shape into small balls. In another bowl, mix the plain flour and the rice flour with some water and make a thick smooth batter. Add the salt and the baking powder. 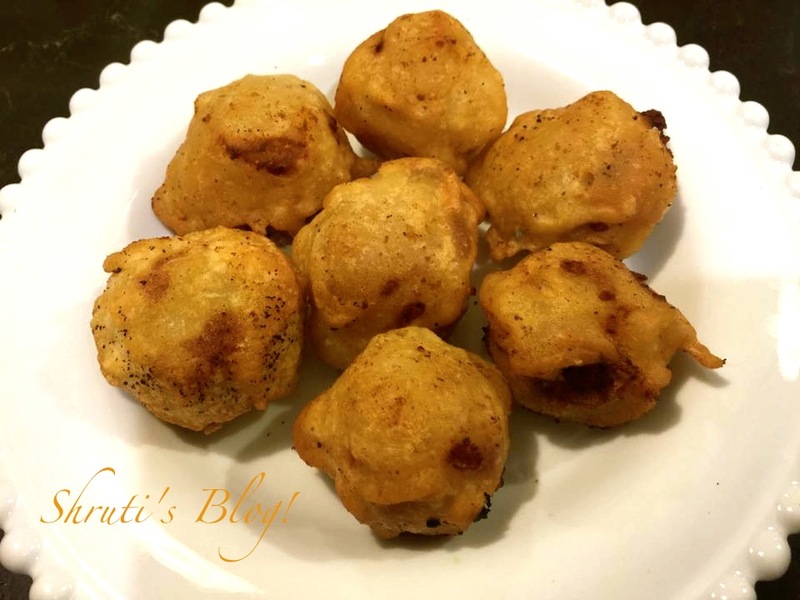 Dip the puran balls into the batter and drop into the hot oil. Batch fry a few balls at a time. The balls will take some time to turn golden brown, due to the rice flour. But once well fried, the balls turn a nice colour. Drain on kitchen paper and serve warm. Shruti, this is so simply described. It seems to be puranpoli's puran but reading your recipe, my ageold fear of the processof puran making is gone. I do very little in the kitchen nowadays but this I am certainly trying out. Thank you .More power to you.